We woke up early (I’m getting up naturally at the crack of dawn every day when I normally struggle to roll out of bed by 8am) and ate free hotel breakfast before heading to the bus station. There were six other travelers on our bus: two Aussies, three Germans, and an American. We were the only ones who didn’t smoke, including the driver! 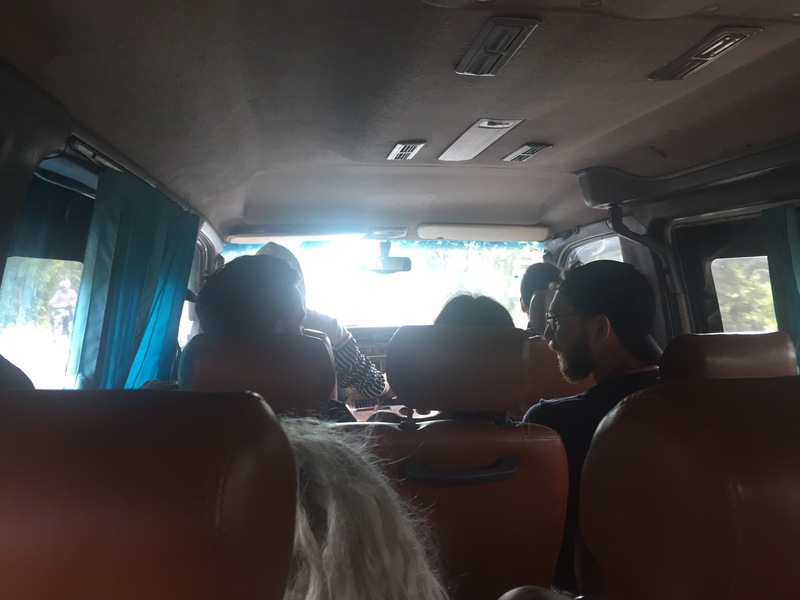 We were a little nervous heading to the Cambodian side of the border because Ted was holding our passports in a waist pouch as we explored Angkor Wat and he sweat right through my Cambodia exit form. But turns out that if you’re willing to pay $2 for expedited service (i.e., bribe the border agents) all your problems go away. 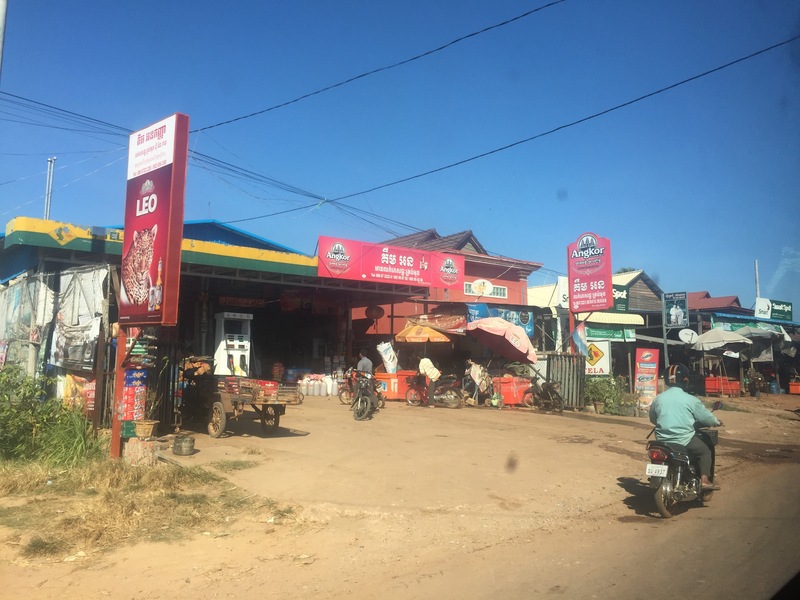 We used Asia Van Transfer to get from Siem Reap to Nakasong, and we mostly recommend it. We had three drivers by the end of the day, and all drove fast and crazy. We had all of these unexpected bus changes, and the last bus we were supposed to use broke down on its way to pick us up from the Laos border, which made us over an hour late getting in, which meant we missed our ride to our guesthouse 20k away, so we had to pay for a ride (it was after dark and we didn’t have Internet so we didn’t know how to get there by bike). Ted bought a sim card as soon as we got into town so we could call the guesthouse, but it turns out that his phone only took micro-sim cards. We ended up cutting down the sim card with leatherman scissors, using a cell phone flashlight while in the back of the van heading to our guesthouse. We got it down to the correct size and called up the guesthouse, and we were dismayed to learn that our host, a lovely Chinese-Canadian woman named Mali, had waited for us for an hour and a half! Anyway, the rest of this post is going to be about Mali and her husband Athalo because they’re two truly wonderful people who brightened our trip. Mali is a gregarious bundle of joy who moved to Canada from China 37 years ago with a sixth grade education, phenomenal cooking skills, zero English language skills, and an insane work ethic. At some point in Canada, she met her husband, Athalo, a quiet, kind Laotian man who also immigrated to Canada. Carp, Ontario, to be exact. They got married, had 9 kids (7 boys and 2 girls), put them all through college, and now spend 6 months in Canada and 6 months in Laos every year in their retirement. 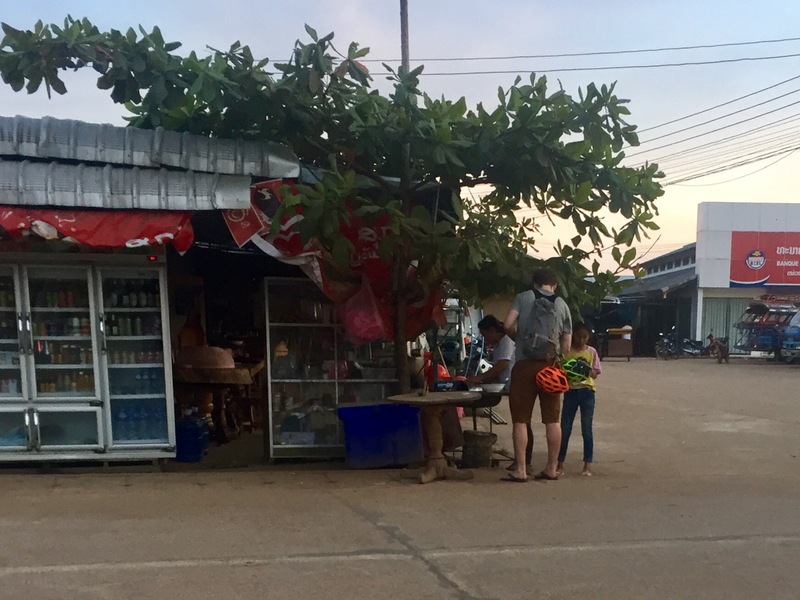 Athalo inherited some land right on the Mekong from his father in the early aughts, and they decided to tear down the dilapidated wooden home in which Athalo grew up and build a small guesthouse on the land. 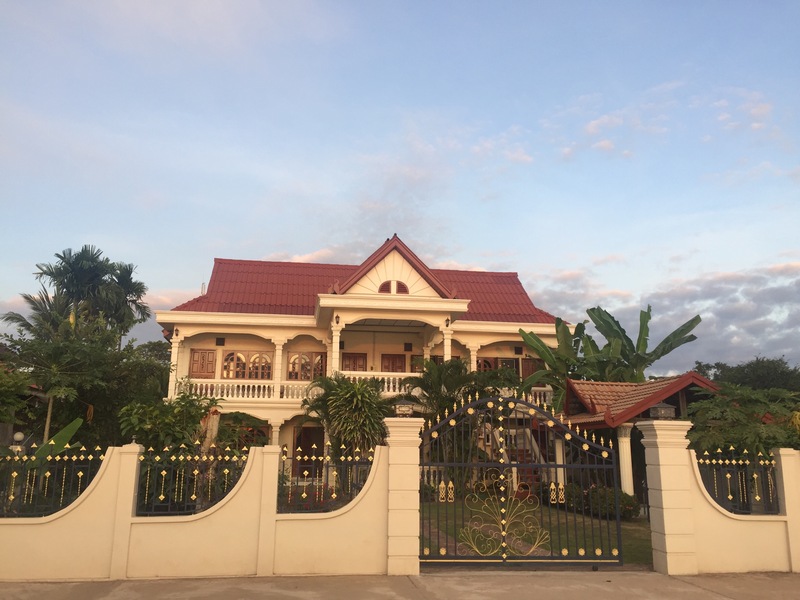 Just 4-5 rooms to occasionally rent out to have some extra income while in Laos. But they don’t really need the money, so Mali reserves the right to send away any snotty people because, she says, her value and happiness are worth more than what they can pay her. If someone makes a booking online she can’t send them away, but she refuses to cook for people she doesn’t like. Booking.com actually asked Athalo why they don’t say breakfast is included on their page, and he responded that Mali wants to be able to decide whether people are worth cooking for. Ha! We’re happy to report that she cooked us both breakfast and dinner, so we made the cut. Anyway, Athalo designed the guesthouse and one of their sons, an architect, drew up the plans, then they built this lovely guesthouse. Mali and Athalo are very much in love, even after 35 or so years of marriage. Athalo’s calm energy perfectly balances out Mali’s brash gregariousness. She can ask him for something from across the compound and he will come running to do her bidding, with an adoring smile on his face. Mali and Athalo now have three homes: two in Canada and this guesthouse. How did they do this, you ask? Hard work! The ultimate bootstraps story! Like I said, they didn’t have a fancy education, but Mali opened a restaurant in Carp and worked 20 hours a day for 13 years! Athalo did most of the child rearing and opened up his own business, too. Mali is hilarious and full of wisdom. She shared so many great stories, so I’ll just recap our favorites here. 1. Mali buys a private island for $30,000 with less than $1,000 in her bank account. Mali is the type of person who decides she wants something and makes it happen. Sometime in the 80s, she saw an ad for a private island for sale in the middle of a river in Ontario, so she decided to go check it out. The island was small, was only accessible by boat, and had a small cottage with electricity. The moment she stepped foot on the island, she knew it was hers. The man selling the house was eager to get rid of it, so he was willing to sell for $30,000. Problem was, she didn’t have any money, not even $1,000 in the bank. But she wanted to secure the place, so she wrote out a check for $1,000 and asked if he would accept this as a down payment. He agreed, and Mali ran back home to call the bank manager, who happened to be her friend, and asked him to cover the check until she had the money. He agreed! In order to afford the island, she’d have to get a mortgage. She needed a 25% down payment because it was a second home, plus all of the fees associated with buying a place – at the end of the day, she needed $10,000 cash. So she worked crazy hours at her restaurant, then moonlighted at a fancier restaurant, and made $10,000 in one month. In the 80s! And just like that, she had an island. The island is now valued at over $200,000, but no one can convince her to sell (people have tried). 2. Athalo is the boss; Mali’s just an assistant. While we ate some phenomenal plates of Lao Laap Mali made, she sat down to chat. She told us that her husband was the boss, and she was the assistant. From what we saw of Mali and Athalo’s relationship, this did not appear to be the case, but she explained that in a business, the assistant takes care of all of the little problems, and when a problem is too big for the assistant to handle, she brings it to the boss. She said that in 35 years of marriage, there has never been a big problem. Ha! I think you had to be there to appreciate Mali’s delivery. Take it from me, it was hilarious. Mali told her kids that if they wake up and don’t want to go to work every day for two weeks straight, they should quit their jobs and look for something else because it’s not fair to yourself or your employer to do a job you don’t love. She said she has always worked very hard — she’ll out-work anyone — because she has always loved her jobs. When each of her kids got married, Mali gave them a down payment for a house for admittedly selfish reasons. She said that the best way to get your kids out of your house and to have them leave you alone and be self-sufficient is to help them buy a house because then they have to get a job to make the mortgage payments. We wish we could have stayed for another day or two, but we have hotels and flights booked and things to do! Mali told us we were doing “buffet style” travel, where we stop over at different places and get a small taste of many things, “but you don’t even know what you’re tasting!” She’s right, and I wish we had unlimited time, but if anyone reading this comes to the 4,000 islands region of Laos, you should skip the touristy party islands and come straight to Mali’s guesthouse, preferably while she’s here between December and May, and plan to stay a while to explore the island of Don Khong. Learn from our mistake! In any case, it may seem odd that I spent almost this entire post writing about two people that we met, but that’s half the reason we travel. The world is a big and crazy place full of injustice and inequality, but outside of these systemic problems, the people who make up the world are good and kind. And it’s important to keep that in mind. 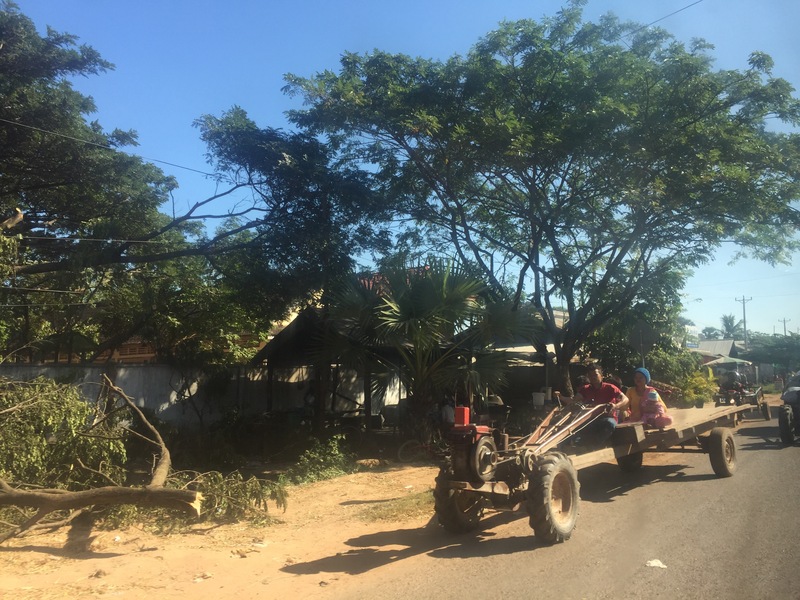 Besides, this blog is also our personal journal, and we definitely don’t want to forget Mali. I love this tribute to Mali and Athalo. You’re correct, the world is full of kind people. Love you and Happy New Year! Mali was the best – so much grit and energy! Love you!